Since the late 1990s, the Indian community in Australia has grown faster than any other immigrant community. The Indian Diaspora has made substantial contributions to the multi-ethnic and multi-religious diversity within Australia. The growth of Hinduism and Sikhism through gurus, temples, yoga and rituals of many kind has brought new colours, images, customs and practices to the profile of Australian religion, and the Australian landscape more widely. At the same time, Hinduism and Sikhism have themselves been transformed as Hindus and Sikhs from different parts of India as well as Fiji, Malaysia and other parts of the world have come together to establish a pan-Indian ethos. Hindus and Sikhs here have also interacted with other sectors of the Australian population and with religions from the Western world. This is the theme of this book. 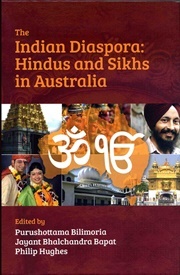 The Indian Diaspora covers the theory of diaspora, the historical development of the Indian communities in Australia since the late 19th century to the present times, current practices and statistical profiles of Hindus and Sikhs in Australia, and interactions between Hindus and Sikhs with the wider Australian community. There are case-studies of the Indian students and women in the Australian community, of Indian communities in Melbourne and South Australia, and of temple building and the Sikh gurdwara. The book has been edited by and contains contributions from Purushottama Bilimoria, an internationally-known scholar of philosophy and religion, Jayant Bhalchandra Bapat, one of Australia’s most senior Hindu priests and a scholar of Hinduism, and Philip Hughes, a leading analyst of the religious profiles of the Australian people. It also contains contributions from several other prominent scholars. Included are special essays on the importance of diaspora by the late Ninian Smart and on the 19th century Afghan cameleers and Indian hawkers.